Everyone can easily learn to play the kazoo! Simply hum into this interesting musical instrument to create a beautiful melody! 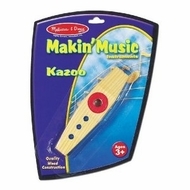 The Melissa and Doug Kazoo is constructed of durable wood to last through every concert! Simply Hum to Make Interesting Music!